Public Value speaks to our time - to the role that museums can play in creating civil societies, to the challenges involved in using limited assets strategically, to the demand for results that make a difference and to the imperative that we build the kind of engagement that sustains our futures. This book assists museum leaders to implement a Public Value approach in their management, planning, programming and relationship building. The benefits are long term public engagement and support, which can be used to demonstrate that valuable returns result from public investment in museums. 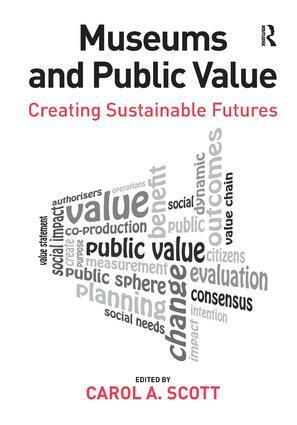 A range of authors from around the world unpack the concept of Public Value and examine its implications for museums. They situate Public Value within current management theory and practice, offer tools for implementation, highlight examples of successful practice and examine the evidence of Public Value that governments seek to inform policy and funding decisions. The book will be required reading for senior professionals in museums, as well as museum and heritage studies students. Carol A. Scott lives in London and works with museum leaders in the UK, Europe, North America and Australasia, using value as a core concept in planning, branding, audience engagement, measurement and funding. She is recognised internationally for her expertise in this area and is in demand as a conference presenter and thought leader. Her writing on museums and value has been published in Curator: The Museum Journal, Museum Management and Curatorship, Cultural Trends and the International Journal of Arts Management.